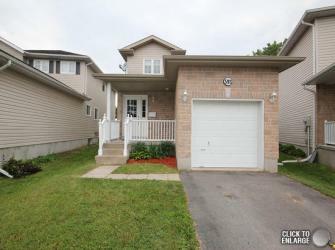 highly sought after, central location in waterloo village located on a beautiful and quiet cul-de-sac resides this immaculate and freshly painted 3 bedroom home thats move in ready. main floor offers powder room, large eat-in kitchen that can accommodate a dining table and chairs with ease, and oversized family room. upstairs offers 3 bedrooms and main full bath all so tastefully decorated. enjoy your summers lounging in your pool or entertaining on your deck in your 130 ft fenced in back yard. the unfinished basement is awaiting your imagination and a few final touches to complete for an additional entertainment space along with rough in for an additional bathroom. this lovely home is certain not to last and close to two parks, schools, shopping, transit and so much more!